In 1969, there were two big films set 60 years earlier in the not-so-old-anymore Old West, both following the adventures of outlaws perpetrating their last jobs. One was the sunny, funny Butch Cassidy and the Sundance Kid. The other was Sam Peckinpah's bloody, muddy The Wild Bunch, a controversial take on the Western formula that cemented Peckinpah's status as one of Hollywood's most volatile talents. Here's an assortment of behind-the-scenes knowledge about this now-classic Western. 1. LEE MARVIN ALMOST PLAYED THE WILLIAM HOLDEN ROLE. 2. IT FORCED A CHANGE TO BUTCH CASSIDY AND THE SUNDANCE KID. 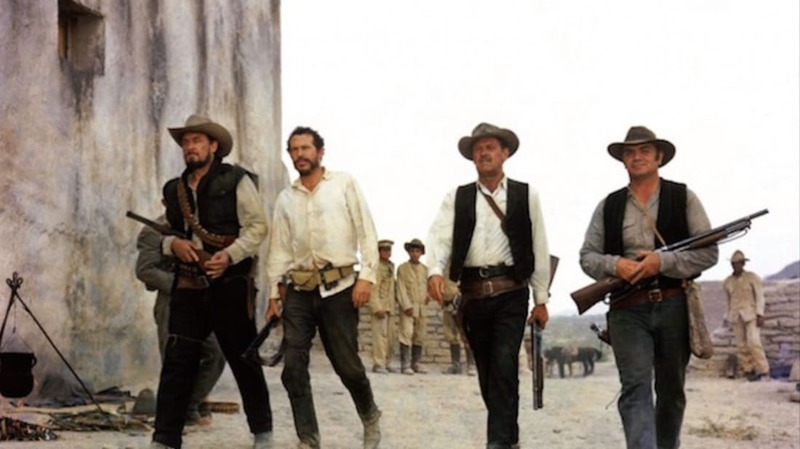 Warner Bros. wanted The Wild Bunch to hit theaters before 20th Century Fox's Butch Cassidy and the Sundance Kid. Over at Fox, they weren't too concerned about the timing, but the competing film with similar subject matter did present a problem. You see, in real life, Butch and Sundance's gang was nicknamed "The Wild Bunch." Nothing to do with this other story, of course; it was just a coincidence. But Fox didn't want their movie to name-check another movie, regardless of which one was released first. (The Wild Bunch beat 'em by four months, by the way.) So Butch and Sundance's crew was renamed the Hole-in-the-Wall Gang, after a place in Wyoming where they often hid. 3. THE STORY WAS ORIGINALLY CONCEIVED BY THE MARLBORO MAN. Roy N. Sickner, a stuntman and occasional actor, had the idea for a movie about aging outlaws doing one last job, for which he thought his friend Lee Marvin would be perfect. Sickner reached out to Walon Green, a writer he'd met while doing stunt work on an earlier film, and the two developed the script (which director Sam Peckinpah later revised). Before all of this, though, Sickner had appeared in TV commercials as the Marlboro Man, a rugged cowboy who smokes Marlboro cigarettes. 4. PECKINPAH INSISTED ON REALISTIC GUNSHOT SOUND EFFECTS. Before The Wild Bunch, the gunshots in Warner Bros. movies all sounded the same, no matter what kind of gun was being shot. Peckinpah, who'd grown up firing guns and doing other cowboy things on his grandfather's ranch near Fresno, California, insisted on each firearm having its own distinct sound effect. 5. ERNEST BORGNINE HAD A CAST ON HIS FOOT. At 52, Borgnine was no spring chicken when he shot The Wild Bunch, but if you notice him moving stiffly, that's not why. He'd broken his foot while making a film called The Split and had a walking cast on it for most of his time on The Wild Bunch set. 6. THERE WERE ONLY TWO MINOR INJURIES DURING FILMING. Ben Johnson broke his finger on the machine gun, and William Holden's arm was burned by a squib (an exploding blood packet). Not bad for a 79-day shoot involving hundreds of stunts, all overseen by a sometimes-reckless director. 7. THERE WERE, HOWEVER, NUMEROUS THREATS OF INJURIES. Robert Ryan threatened to punch Peckinpah if he wasn't given time off to campaign for Robert F. Kennedy, and Borgnine threatened the same if he didn't get a break from the choking dust and heat. Then there was the time a crew member was assigned to club another crew member in the head. It was during the scene where the bridge is blown up, a dangerous sequence that had stuntman Joe Canutt worried about the safety of the men and horses involved. When special effects coordinator Bud Hulburd ignored Canutt's concerns, Canutt recruited another crew member and gave him a secret assignment: stand near Hulburd with a concealed club, and if any of the stuntmen fell into the water prematurely, hit Hulburd over the head to prevent him from setting off the last explosion. Fortunately, everything went smoothly, and it wasn't necessary to whack Hulburd upside the head to save anyone's life. 8. PECKINPAH ENJOYED GIVING HIS ACTORS A HARD TIME. Peckinpah was a rascal, to put it mildly—a heavy-drinking, hard-living, sometimes violent man not too different from many of his movies' characters. The lighter side of all that is that he was fun-loving and rambunctious, and he enjoyed good-naturedly (?) harassing his actors. On The Wild Bunch, he targeted Strother Martin (who later said, "I sensed that he liked me but I wasn't sure"). According to the film's editor, Lou Lombardo, Peckinpah knew that Martin was afraid of horses—so he gave him the tallest horse to ride, then made him mount it while facing downhill. 9. THEY PAID A MEXICAN TOWN TO PROCRASTINATE BRINGING IN ELECTRICITY. Much of the film was shot in Parras de la Fuente, Mexico (home of the oldest winery in the Americas). In 1968, the town was still small and rural enough to pass for 1913, but Peckinpah was almost too late: local officials were on the verge of going electric. The addition of power lines would have ruined the scenery, so Peckinpah got his producers to pay the town an undisclosed amount of money to put it off another six months. 10. THEY HAD 350 MEXICAN SOLDIERS' UNIFORMS BUT BLEW UP 6000. Wardrobe supervisor Gordon Dawson had his hands full keeping the extras who played Mexican soldiers dressed appropriately. He had plenty of uniforms—350 of them—but the Mexican soldiers in the film kept getting shot or blown up, and the costumes would be torn and/or bloodstained after almost every take. Dawson and his team worked around the clock to clean and repair them almost as fast as Peckinpah could ruin them. In all, those 350 uniforms clothed about 6000 men. 11. PECKINPAH NEVER FORGAVE HIS PRODUCER FOR THE CUTS HE MADE. 12. WHEN IT WAS BEING FILMED, THERE WAS NO WAY IT COULD BE RELEASED. Before the Motion Picture Association of America came up a ratings system to distinguish kid-friendly movies from grown-up ones, Hollywood followed the Production Code, a set of rules intended to make sure any movie released was more or less suitable for more or less any audience. (Basically, everything had to be the equivalent of a G, mild PG at most.) In place since the mid-1930s, the Production Code was starting to outlive its usefulness by the late '60s, as its archaic rules—even married couples couldn't be shown sharing a bed, for example—were increasingly out of touch with modern sensibilities. 13. IN 1993, IT WAS RE-RATED NC-17. The MPAA's rating system changed a bit during its first few years of existence (M for Mature became PG for Parental Guidance, for example). So when movies from that era are re-released, their distributors often resubmit them to get a rating that reflects current usage. The new rating is usually milder (a lot of Rs become PG-13s), but when Warner Bros. sent The Wild Bunch in for grading, they got a surprise: it came back as NC-17! Mind you, it was the same film that got an R (not an X) in 1969. The movie hadn't changed, but the MPAA said the public's tastes had. "In the last decade, there has been a public outrage about violence," said MPAA president Jack Valenti. "The judgment of the ratings board, which is comprised of parents, is that the degree, the intensity and the persistence of violence in The Wild Bunch is beyond the ken of young children." Warner Bros. appealed for an R rating, and the MPAA eventually relented without requiring any edits.